Whether the ‘what-if’ in question is one of technology (aka science fiction) or an imagined world of fancy (aka fantasy) or somewhere in between or neither (and in truth, for all of the labeling I’m doing for you here, I’m not much of a fan of labels), I have been addicted to the speculative fiction genre since I can remember. I cut my literary teeth on a steady diet of Lloyd Alexander and Ursula Leguin, with a dash of Stephen King (we’ll gloss over the Sweet Valley High addiction here, although I won’t lie and deny it existed.) I started writing at age thirteen, and it was fantasy that I chose from the very first. 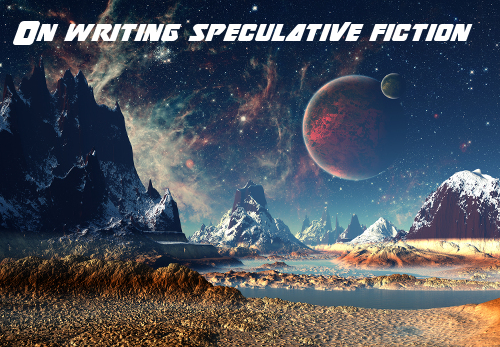 If I had to list one question that I am asked, it would be “Why speculative fiction? Why would you choose to write something so decidedly ‘un-real’”? I will make every effort here to explain why I find myself so much more at home, in a literary sense, in the un-world. The imaginary worlds of speculative fiction, for me, are not a matter of escapism. They are a mechanism that allows us to delve more deeply, more truly into our world than fiction set in the real world can. When we write a story that takes place in a world we know, with stoplights and construction workers and libraries, we read that story through a lens of our own experiences. Those stoplights become the ones that hold us up on our own way to work, the construction workers take on the cast of someone in a hard hat that we once knew, the libraries become our own local branches. We cling to our own viewpoints and perspectives, which doesn’t present a problem to a story that is a bit of escapism to curl up with on a rainy afternoon. If, however, a story is aiming to challenge those closely held perspectives, talk about our future, about our natures, it is necessary to pull us away from them. If I put you into a space ship, then take you into the library, rather than picture the library in your own town, you lean a little closer – now you’re listening so you can find out what shape a library on a space ship might take. If I take you to a town where peasants are dutifully building an iron edged wall around their village to keep out the brownies and the Fae King, you’re ready to build an entirely fresh perspective on the agents of construction. The same holds true for bigger concepts. Those of us who are deeply enmeshed in a political system of belief, religious beliefs, even a sense of personal fashion – when we read stories that directly challenge that cherished position, I think most of us find ourselves shying away. However, when you step away from reality, away from our own world, away from a system that pits your beliefs against the familiar antagonists, you might find that you can forget about your own convictions and just enjoy the story. While I don’t think it’s the intent of the speculative fiction writer to go about changing everyone’s beliefs, the writer who works in the un-world gains access to stories that can make use of powerful imagery, deeply moving emotions and enormous scale minus the thorny difficulty of navigating those firmly held belief systems without putting walls between story and reader, because after all, what’s a storyteller or a story without an enraptured audience? And so, in answer to my mother’s long ago advice, to me, what I write is real. I think reality is what’s left when you take away all of the notions and prejudices that we have built, and work in a place where our concepts (if we’re very lucky) can be heard without all of the background noise.